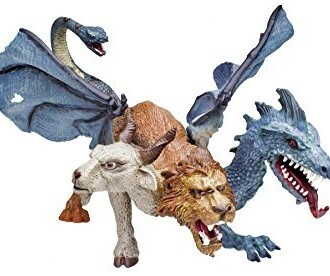 Lion, goat, and serpent, the Chimera continues the mythological tradition of frightening hybrids. She comes from a famous family as well, counting the three-headed hellhound Cerberus and the nasty five-headed Hydra among her brothers. 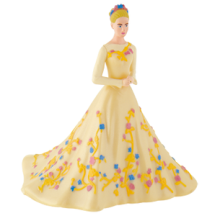 SKU: SFR801429. Category: Fantasy, Fairytale & Mythology, NEW ITEMS!. This creature captures the most frightening character that ancient imaginations could create. 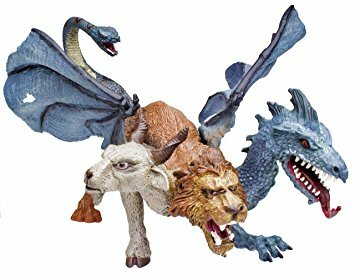 The Chimera has heads of a lion, goat, and serpent, a powerful lion body, wings like a dragon, and a poisonous snake for a tail. All the Safari range products are Non-toxic and BPA free.